There can be few industries as competitive as the restaurant business. As one opens with high hopes, another one closes with little fanfare. If you’re considering venturing into these shark’s fin soup-infested waters, you’d better have a watertight restaurant business plan to hand. This will get you up to speed on everything you need to know about running a successful restaurant – from local competition to health and safety laws. In addition, it also shows any bank or significant funder that you mean business. Here are 10 essential ingredients you’ll need for your restaurant business plan. Start your business plan by introducing to any potential investor the basics of your restaurant idea. This should include your dining concept – whether it’s haute cuisine or high street burgers – as well as its name and planned location. You should also talk about what makes you – and any other partners – qualified to succeed, including previous restaurant and business experience. This is a more detailed company description, including further information about the location of your restaurant. What’s the population, how often do people eat out and what kind of restaurants do they patronise? Give details of the local competition – or lack of it – and focus on why your restaurant will appeal to your target customers. The Business Analysis should also include information about your restaurant’s legal name and status, such as sole proprietorship or partnership. List details of all the employees at your restaurant, including managers and human resources, chefs and kitchen staff, waiters and waitresses, and more. You should also give a breakdown of each department and who is in charge of running it – an organisational chart to show employee responsibilities is worth including. Salaries, bonuses and employee benefits, as well as training costs, should also be listed in this section. How are you going to promote your restaurant and what are the costs involved? Give details of the kind of marketing you have in mind to draw your target customers to your restaurant. You may have a larger marketing budget in mind to advertise via print, TV or radio. Alternatively, your ambitions may be smaller and your intention to focus on creating a local buzz through social media, local news and promotional leaflets. Describe how your marketing plan will set you apart from the competition. This section will include all the equipment and furniture you need to open and get your food out of the kitchen as quickly and cost-efficiently as possible. Refrigerators and freezers, ovens and fryers, coolers and pantries, blenders and dishwashers – the list of equipment will depend on the type of restaurant you’re running. Do you plan to buy your kitchen equipment outright or lease it? You’ll also need tables and chairs, cutlery and decorations. Include a cost breakdown for everything you’ll require. Where are you planning to buy your supplies from and how much will everything cost? Do you already have established contacts with key suppliers? Discuss your inventory and how you plan to manage it to avoid over- or under-ordering. 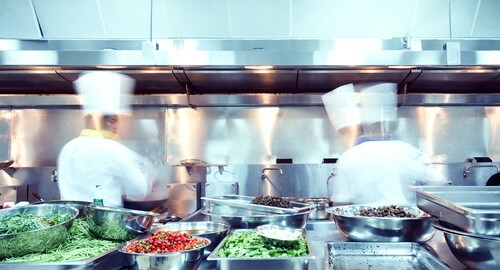 Food supplies are one of the biggest operational costs for any restaurant so a well-thought out plan to minimise waste is essential. You’ll need a detailed section on which restaurants will be vying for your target customers’ attention. Are there other restaurants nearby offering similar food and how will you set your own business apart? Poaching customers isn’t as easy as poaching an egg, so don’t just assume everyone is going to flock to your restaurant because it’s new. If you have successful competition, look at their menu, their prices and their business hours to see what they’re doing right. Give full details of what you’re planning to serve as well as how much each item will cost and projected profit margins. Perhaps you have plans to develop your brand image through the sale of t-shirts, accessories and food items. If so, you should also include further information about these items here. Create financial statements for your business, including personal financial statements for each partner or major stakeholder. A financial breakdown of your business should include a cash flow and income statement, together with a detailed balance sheet. Always provide accurate information and offer realistic projections – this is more important to potential investors than the actual figures involved. Having given a realistic assessment of the costs involved in launching your restaurant, how much are you going to require in capital investment, and from whom? Are you going to seek a bank or other long term loan, or do you intend to rely on equity, angel investors or P2P funding? Think about the type of funding you require and reiterate why your restaurant should be considered a good investment. Don’t be afraid to include possible risks involved – your funders will be thinking about them so you should acknowledge them too, as well as how you plan to overcome them. There are plenty of ways to find restaurant business finance but you have to be sure of which platform you choose. Behind every Anthony Bourdain there’s a strong business plan so don’t neglect yours or your restaurant will end up ‘in the soup’. To give your restaurant idea every chance of success, put the best possible ingredients into your business plan and make sure you’re hungry for success.